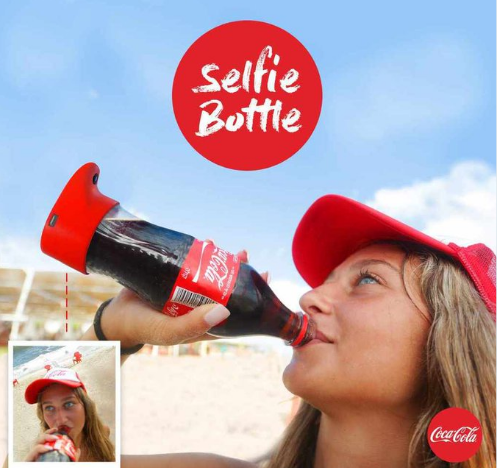 Coca-Cola has designed a â€œSelfie bottleâ€￾ that will take your self-portrait which you can instantly share with your friends on online platforms like SnapChat, Facebook and Instagram. The bottle is fitted with an in-built camera at its base and a sensor to detect when it is tilted to 70-degree, at which point the camera takes a snap of its owner mid-drink, Drum News reported on Friday. The â€œSelfie Bottleâ€￾ has been devised by Gefen Team for the Coca-Cola Summer Love campaign â€” Israelâ€™s largest outdoor brand event. â€œUsers tag themselves and their friends in photos on Coca-Colaâ€™s social media assets. It really does the trick and makes the partygoers more present and active during the event, knowing they can share their special moments just by drinking,â€￾ Coca-Cola said in a statement.